I began my awareness of solar energy possibilities back in the late 70s, but lacked the time and funds to do anything. A DIY solar hot water system was in the plans for the house extension in 1988. It's shown on the approval local government plans, but never got built. That extension took me 4 years to finish, and energy (mine!) and funds ran out. I did install a stainless steel off-peak system about that time, which cost about $1,700. The same model with solar collectors was $3,700 back then, and I could not justify the extra cost. Electricity was cheap (night time off-peak is still about 40% of the day rate, at 5.5 cents per kilowatt-hour. Of course, the off-peak power from the grid's coal-fired power-stations was no greener than any other time, but there was probably some green benefit in that enough off-peak users defer the need for building more power-stations. Certainly it saved us some money over the years. we are all more aware of the damaging impact of the overuse of fossil fuels - much more than we were in the 70s and 80s. The solar hot-water industry has matured and become more competitive - there is now much more choice. In Australia there are now healthy government inducements to going solar. The Federal government will give a $1,600 rebate for an approved solar (or heat-pump) hot water system if it is replacing an electric system. The NSW state government has a rebate as well (in my case, that will be $800). Finally there are the renewable energy certificates, worth about $1,350. Heat-pump hot water is now well established, whereas it was non-existent in the 80s. There are many brands to choose from. 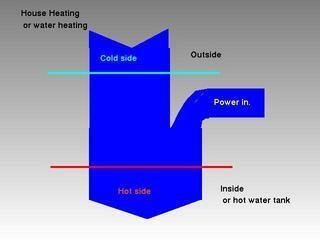 Just about all the hot water system manufacturers have one now. As you will see they are much cheaper to install - no messy bits on the roof, with the attendant labour costs. lastly the old electric unit was nearly 20 years old, and the 2,300 mm high tank next to the back door of the house was showing its age. It had develop a considerable lean, partly due to settlement of the concrete pad it sat on, and partly due to rusting of the outer steel case's bottom. No leaks yet, but even 316 Stainless Steel has a finite life. I love the idea of a passive system, ie, no moving parts to fail. As our old Edwards SS electric had served us well, I got a quote for an Edwards SS roof-mounted close-coupled solar heater. I picked the higher efficiency sputtered titanium coated copper absorbers to give a better solar energy return. Unfortunately I was taken aback by the price of nearly $7,000 installed. After all the rebates and RECs it would have still cost $3,000 out of pocket. I scoured the market via Google to see what alternatives were out there. Seems all the solar models suffer from the extra cost of installation for the roof-top collectors (and tank if close-coupled). No real surprises there. Also most ones on offer have mild steel tanks, coated inside with vitreous enamel (so called "glass lined" tanks). As these have a typical life of 7-10 years only, it makes little sense to me to make the extra investment for something that could be junk in 7 years. This is not magic, just the laws of thermodynamics at work. The secret is that absolute zero (ie, approximately the temperature of outer space, known as 0 degrees Kelvin) is -273 Celsius. A winter outside temperature of say 5 degrees Celsius here in coastal NSW is therefore 278 degrees Kelvin, ie, very hot compared to outer space. There is a lot of heat energy in air at 5 degrees C. Problem is that it is at too low a temperature to be useful. That's where the hear-pump comes in. 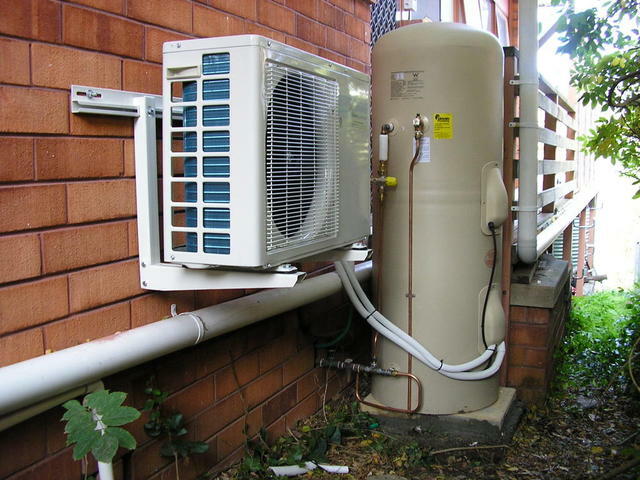 Like a water pump lifting water from a well to a useful location, a heat pump lifts heat energy from a low temperature to a higher one where it can be useful. Like a water pump, you only have to pay for the energy to run the pump, not for the actual water. Here it is in a diagrammatic form. We are extracting heat energy from the colder side and pushing it out to the warmer side. Note that the power input (usually electricity for the compressor) is added to the warmer outflow. This is a natural consequence of the law of conservation of energy - the power is converted to heat energy and has to come out somewhere. In heating mode this is a double bonus. The width of the flows is proportional to the amount of energy in each, so you can easily see why we get more out than we have to pay for. Once I had accepted the idea of a heat-pump, which is still really a solar heater (it is the sun that heats our atmosphere) it was a question of which one. It boiled down to 2 at the last. 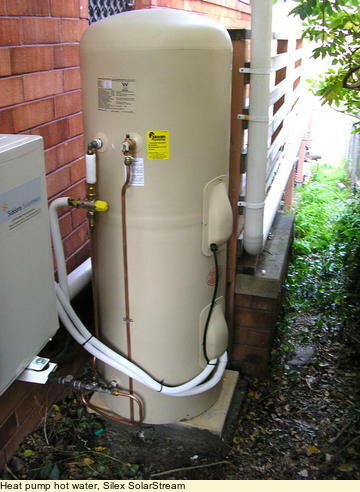 One was the all-copper Saxon SolarStar heat-pump, made in Queensland. It uses a low pressure tank, with a copper tube heat-exchanger coil in the top through which the household hot-water passes. 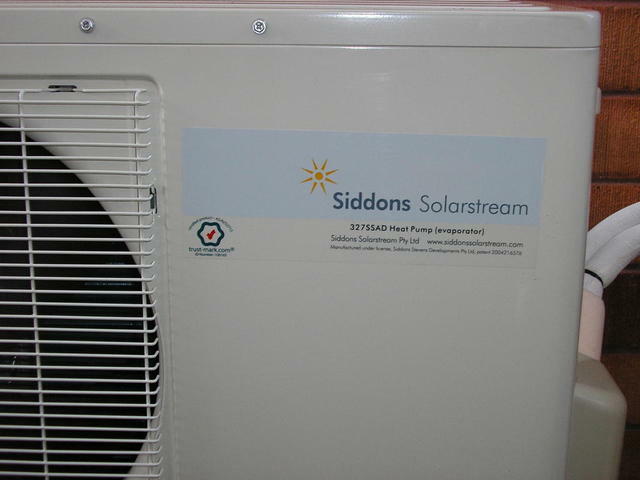 The other was the Siddons SolarStream, with a stainless steel tank. Both has a separate compressor unit, pre-charged with refrigerant, and pre-charged copper pipes to connect to the tank's heat-exchanger. The couplings have a membrane which is pierced during the installation phase, so in theory you do not need someone with good refrigeration knowledge to install it. better warranty on the mechanical bits - 4 years on the compressor, which beats every other manufacturer. 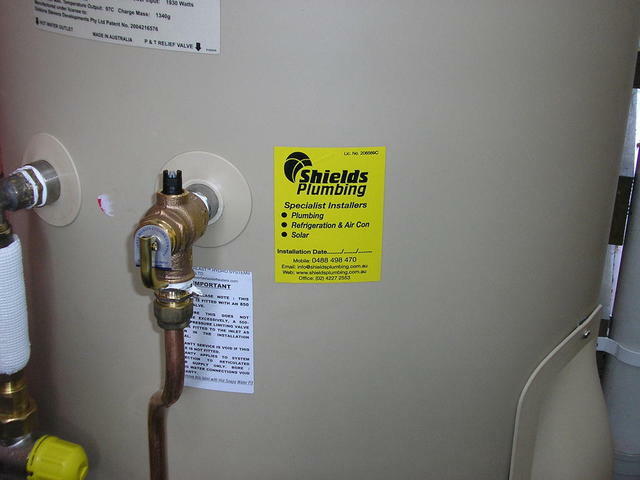 Siddons were able to recommend someone with the skills to install. I've had a lot to do with refrigerant systems over the years and know that scrupulous care is needed to prevent leaks and contamination of the system - these can destroy the compressor. The Siddons is made in Victoria, so hopefully their claims of it operating efficiently at very low ambients is correct. It would need to in the colder parts of Victoria, and we do sometimes get down near zero in our gully. It was installed on 16th May 2009, just approaching our southern hemisphere winter. Charlie Shields was the guy Chris Siddons of Siddons http://www.siddonssolarstream.com/ suggested. 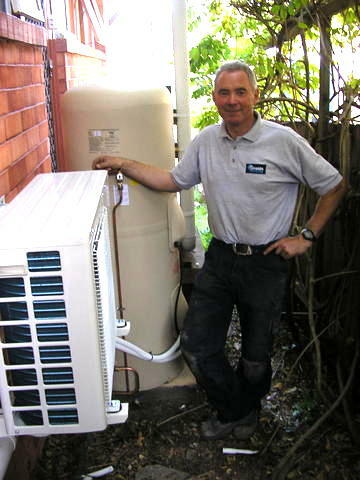 Charlie is from Ireland, and specialised in central heating systems, as well as general plumbing and refrigeration work. After many holidays in Australia he and his wife decided to come for good, and he is quickly building up a new business here, specialising in solar and heat-pump hot water and hydronic central heating (ie, hot water pumped from a high efficiency gas boiler to radiators or sub-floor coils - probably the most effective and efficient heating for those in the cold climates - and yes, it does get very cold in some parts of Oz). The system was supplied by FX Larkin of Unanderra (I got their number from Siddons) and Charlie does a lot of work for them. He can source the system too. The whole installation took just 4 hours, including draining and removing the old tank, cementing in some pre-cast slabs to sit the new tank on, the plumbing, electrical and refrigeration work. Here's a shot of Charlie next to the finished job. I was really impressed with Charlie's skills and equipment. I had a lurking fear that the installer might not have enough refrigeration experience, and fail to leak test the system adequately, or let in some moisture. Moisture is poison to compressors - it can combine with the refrigerant over time and lead to corrosion and electrolytic transfer of copper from the pipes to the internals of the compressor. I had no need to worry - Charlie has both the experience and tools, such as an electronic refrigerant leak detector. Since arriving in Australia he has acquired 7 certificates, covering plumbing, electrical work and refrigeration. In the UK he had just one consolidated certification, but is getting used to the somewhat fragmented approach here. Compressor unit on the wall This is on the cold, south side of the house, so I had it mounted off the ground so that there is minimal risk of the unit sucking in its own cold air and icing up. Ideally it would have been on the north, warmer side of the house, but there is no room there, and it would have been a long and less efficient piping run. Here's a close up of the tank. You can see the moulded plastic outer shell - no rust! There's a tempering valve too, to restrict the temperature of the delivered water to 60 degrees C. This is now mandatory for showers and baths, as an anti-scalding measure. Its only the 3rd day, but plenty of hot water, and the compressor is very quiet - barely audible, inside or outside the house. The neighbours are happy too! I'll be monitoring my quarterly electricity bills, and will post the results here as they come in. Because we get a separate consumption figure for the off-peak meter, I'll be able to accurately judge how much less we end up using for hot water. The tank insulation appears to be much better than the one it replaced. That got warm to the touch on its flat top surface, and was a favourite spot for our cat to sit and survey the world in cosy comfort. The Siddons unit stays cool on the outside, demonstrating that the insulation is extremely effective. You bet! Of course I can't pass much comment on the system - ask me in a few years. However, the quality of the construction and the quietness of the compressor bode well. As far as Charlie's workmanship, skill and friendliness goes, I'd definitely recommend him - this is an excellent installation! If you are thinking of a new solar or heat-pump system, and are in the southern end of Sydney or near Wollongong, give him a call. Performance Data - Early Days, but Looking Good! Based on the electricity bills I've kept, and a few recent readings of my own, I've been able to calculate the average energy used per day. I can do this because the old heater was on its own "off-peak" meter (meaning it could only run late at night, but at a much cheaper rate). I've had the rate changed to "Off Peak 2" which is on 16 hours a day, but at a higher rate (still less than the normal 24 hour rate). Its early days, but you can see the great reduction in daily use since the heat-pump went in. The average has dropped from about 7 Kwh/day to 2! 25/09/06 280 83598 9 did not keep the bills between Sept 06 and Dec 05! As you can see the average daily power consumption has dropped a lot, and continues to be much lower. 31 Oct 2009 - Its now been about 6 months, so how is it going. really no problems - it just works! in hindsight I should have had it mounted on the ground. Issue is noise, which is very low, and no problem at all to my neighbours on that side of the house. However, in our laundry the noise seems a bit higher! Still not a nuisance, but you hear it at night on occasions. We naturally think of brick walls as solid things, but it seems the brick wall is in fact acting as a sounding board, making the unit more audible inside than outside. My plan is to pour a small concrete slab and then sit the compressor unit on concrete blocks on the slab. Its on my list 8-D - will get done one day! Still going strong. I have changed the compressor unit mounting so that it no longer hangs off the wall, and was able to retain it at the original height so that there is no likelihood of it ingesting its own cold air exhaust. The reverberant noise inside the house has disappeared, as hoped, now that it is not hanging off the brickwork. The has been some slight rattling from the metal grille over the exhaust side, but this was easily fixed by a bit of tweaking of the grille, and the odd bit of rubber packing.